I always get super excited when there are good deals, you all know this. But what makes me even more excited is that there is a good deal to a destination I visit frequently as a connection point. Berlin is one of my favourite places as it is a great connection for Avios users to the Middle East, now this became even better as there is a Muslim Friendly Hotel in Berlin. How amazing is this? I saw the post yesterday on Halal Trip. I believe they are part of Crescent whom I love, as they are a travel rating agency based in Malaysia. I met their boss at the Global Islamic Economy in Dubai and they have done some great work MashaAllah. Worth exploring them a little if you are interested. Back to our Berlin Hotel. 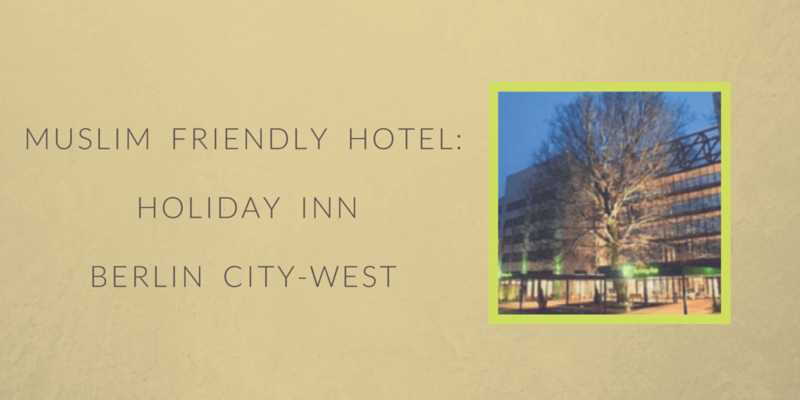 What makes this a better offer is that we are talking about the Holiday Inn Berlin City-West. They have equipped the rooms with all the necessary things that a Muslim will need, which makes it so hassle free. No need to try and figure the prayer direction, they have it marked in the room. Plus a prayer room in the hotel which can come very handy if you are more than one family staying together. Here is what you get from their website. Handshower / Bidet in guest bathrooms. Prayer facilities can be arranged upon request. Halal option can be arranged for in-room dining. A list of Halal restaurants nearby the hotel. Halal banquets can be arranged upon request for special occasions. A copy of the Quran can be provided upon request as well. Tripadvisor gives it a 3,5 rating out of 5 and you can check it here. I know many people prefer to have a Muslim friendly hotel or they totally reject travelling anywhere besides Turkey in Europe. So, this will be a very welcome addition to their travel map inshaAllah. I have an upcoming trip in July to Berlin and might give it a go so I can write a review for you guys. 🙂 It will be interesting to see how they treat their Muslim customers. If you are not a points collector or an Elite member with IHG I would recommend using Halal Trip to book your stay. It is always good to support each others initiatives in such a competitive world. Tip: I have said this before, but when you make a booking, email the hotel few days before your stay to reconfirm and request your Muslim amenities in your room. This will make it hassle free inshaAllah. Salams Nasreen, I am not familiar with any eateries but I recommended checking the zabiha app for this. Thanks alot for the info. Jazak Allah Khair! Please continue to post details of Muslim friendly hotels (having facilities like hand/bidet spray beside the toilet commode-WC). Such info, really helps, when we lookout for destinations. Please continue posting details of hotels in Europe that has facilities like a hand spray beside commode (WC). We wanted to visit Prague next year but most of the hotels responded that they don’t have a hand spray next to their commode.